The audience at the 2018 PyeongChang Winter Olympic Games had futuristic experiences such as augmented reality based navigation and 360 VR broadcasting for Immersive virtual reality. Dubbed as the most high-tech Olympics to date, South Korea used the games both as testbed for 5th Generation (5G networks) and to showcase its technological prowess in this arena. 5G cellular mobile telephony has promising data speed of the order of 20 Gbps and uses case scenarios which are nothing short of fiction. Over the last three decades, hand-held devices communicating over digital cellular networks have created whole new businesses around social interactions, entertainment and personal messaging, while transforming traditional sectors such as banking and transportation. Smartphones, as they are now known, perform a multitude of functions in addition to voice calling, from gaming to banking and video streaming to shopping or utility payments and even transforming into artificial intelligence powered virtual assistants communicating in natural languages to send texts, make voice calls, order food, find routes or book a cab. The race towards full-scale commercial deployment has been marked by intense competition amongst the established telecom network gear makers like Cisco, Samsung, Ericsson, Nokia, Fujitsu and Huawei to have their products out and gain a first-mover advantage. Competition is equally strong amongst countries to serve as test-beds which is being facilitated through measures ranging from partnerships with industry to offering test-bed facilities and speeding up spectrum allocation procedures. Enhanced Mobile Broadband (eMBB) can enable high user mobility, especially under scenarios requiring high data rates across a wide coverage area or ultra-high speed connection such as on trains or in thickly populated areas. It can also support Virtual Reality and Augmented Reality services. Massive Machine Type Communications (mMTC) can support a very large number of connected devices, such as in the case of Internet of Things (IoT), with varying requirements of quality of service and located in a small area such as an industry or a production facility. This enables high density of connectivity (around one million connections per square kilometre) for smart cities, smart power grids, smart industries, etc. Ultra-Reliable Low Latency Communications (URLLC) lays down stringent requirements on latency, which is as low as one millisecond (compared to 50 milliseconds for 4G LTE), as well as reliability in terms of packet loss of better than one in 10,000 packets. Enabling communications in mission critical applications, this technology finds applications in robotics and autonomous vehicles. Traditionally, 2G and 3G mobile networks relied on microwave wireless backhaul3 to connect cell sites with the nearest switching centre. With increasing data flow, 4G LTE introduced IP-based connectivity, replacing copper- or microwave-based cell sites with optical fibre. 5G applications and use-cases will generate immense amount of data, and therefore, one of the fundamental requirements for timely and effective 5G deployment is optical fibre based strong backhaul infrastructure. Although wireless (microwave radio link) backhaul option is cheap, quick and easy to deploy, as compared to wired backhaul (copper or optical fibre), it has severe bandwidth limitations. It is also prone to interference if unlicensed spectrum is used. A good optical fibre network, in a way, is essential for 5G. In the run-up to 5G, countries with limited optical fibre network are accelerating cable roll-out. The UK, for instance, has earmarked £6.85 billion for 5G infrastructure upgrades by 2021, which includes increasing fibre penetration. 5G deployment is also an attractive business case as its demand has traction across the globe. 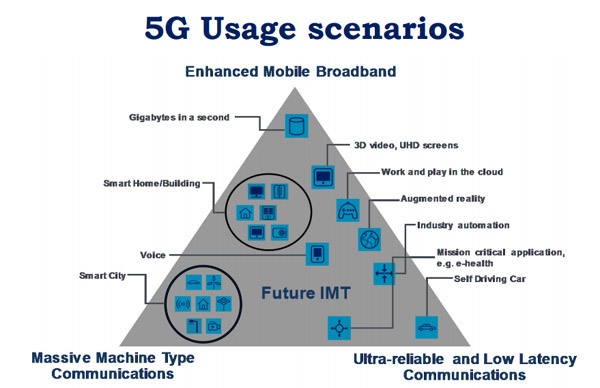 As per an ITU estimate, a small cell 5G network deployment could cost around USD 6.8 million for a small city to 55.5 million for a large, dense city.4 The European Commission estimates the total cost of 5G deployment across the 28 Member States to be around EUR 56 billion.5 This could pose a dilemma for developing countries, especially those that are still in the process of provisioning 4G services nationwide. 5G is certainly going to be a money-spinner, but telecom operators have to work out the business case for such levels of investment into 5G networks. As far as the technology market is concerned, it is going to be extremely competitive, especially with Huawei already having caught up with its Western counterparts in technology and starting to eat into their market share. India, with the second largest mobile phone subscriber base globally, has also joined the race for 5G – notwithstanding the delayed adoption of previous generations of mobile networks. The commercial launch of 3G services took place in Japan in 2001, but arrived in India only in December 2008. 4G roll-out in 2012 came three years after the first commercial launch in 2009. India is not a key player in technology development or manufacture of telecommunication equipment.6 Like its predecessors, 5G is also likely to rest upon either technology imports or equipment made by foreign vendors in India. While hopping onto the 5G train, India has to bridge significant infrastructure gaps and work out economic benefits for the consumer interest in 5G services. Despite being home to over one billion mobile subscribers, the Average Revenue Per User (ARPU) for telecom service providers has nose-dived from INR 123 in 2015 to a meagre 69 by the end of the second quarter of 2018.7 That is not the end of woes for Indian telecom service providers. The industry, with revenues of under INR 2.5 trillion, has a cumulative debt of 7.7 trillion.8 Close to 30 per cent of their revenue goes to the Government in taxes and levies.9 The industry is under severe financial distress, with falling ARPU, declining revenues, mounting losses and increasing debt. The import duty for equipment such as base stations, optical transport gear, 4G LTE products, gateway controllers, carrier Ethernet switches etc., has further been increased to 20 per cent.10 5G deployment is a costly affair and debt-ridden telecom service providers have to work their finances out before they chart out plans for acquiring 5G spectrum or investing in equipment. Moving on to the question of enabling infrastructure, India will have to make a quantum leap in optical fibre penetration for 5G deployment. 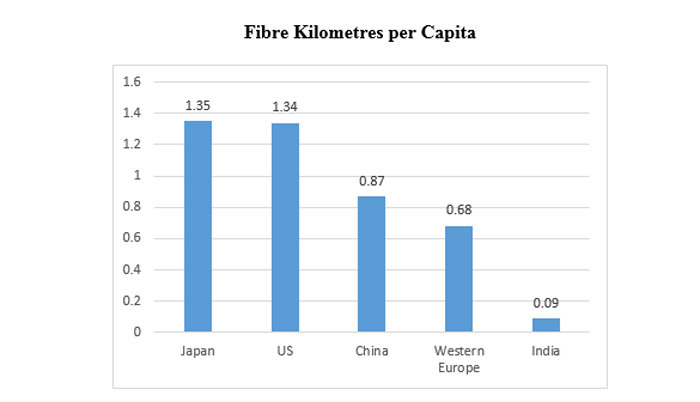 At present, with approximately 1.5 million kilometres of optical fibre cables, under 25 per cent of the cellular network towers have optical fibre backhaul, the remaining rely on microwave backhaul.11 Optical fibre kilometres per capita in India is around one-tenth that in China and one-fifteenth of that in Japan. As mentioned in the National Digital Communications Policy 2018, the fibre-to-the-tower programme is supposed to enable at least 60 per cent of telecom towers thereby accelerating migration to 4G/5G. The government’s flagship BharatNet programme also plans to link 2.5 lakh gram panchayats through optical fibre network. However, to achieve these targets a major change is necessary in existing construction and clearance processes. The sheer lack of utility ducts along roads/highways means escalated costs and high turnaround time. On top of that, issues like Right of Way derail fibre connectivity plans. Deployment – An early roll out of 5G services to maximise the value proposition of 5G as a technology. Technology – To build indigenous industrial and R&D capacity, especially for the design and Intellectual Property. Manufacturing – To expand the manufacturing base for 5G technologies, which includes both semiconductor fabrication and equipment assembly and testing. The new National Digital Communications Policy 2018 also envisages a digitally empowered economy and society, which essentially means that the information and communications needs of the citizens and enterprises are met with a ubiquitous, resilient and affordable digital communications infrastructure and services.14 India’s journey to 5G is not going to be a cakewalk. Looking at the abovementioned three priority areas, India has vast ground to cover before the worldwide commercial launch of 5G in 2020. An early rollout means heavy capital expenditure. Given the weak balance sheets of telecom service providers, an early rollout would further increase their debt burden. Moreover, the technical requirements for 5G call for significant changes in the national spectrum policy and regulation as well as the policies related to infrastructure development. Low optical fibre penetration is a major infrastructure shortcoming. Imports account for a whopping 90 per cent of India’s telecom equipment market.15 India’s exports of telecom instruments in 2017-18 were worth USD 1,201.7 million, against imports of 21,847.92 million.16 To change this equation, The Telecom Regulatory Authority of India (TRAI) has recommended measures to bring imports to ‘net zero’ by 2022, for both economic and security reasons. However, it is widely acknowledged that equipment manufacturing holds a small share in the overall telecom business. Innovation, R&D, design, and sales and services comprise a majority of the business.17 These segments of the telecom business are more capital intensive which actually generate Intellectual Property for the Original Equipment Manufacturers (OEM). Indigenous manufacturing, on its own, is not a solution for security and economic concerns. The entire manufacturing process is based on global supply chains, as components are sourced from different countries depending upon their respective competencies. It is economically and logistically unviable for a single country to manufacture telecom products end-to-end on its own.18 Forcing foreign vendors to manufacture in India, as part of the flagship “Make in India” programme, could prove counterproductive if it entails disruption in the global supply chains of OEMs. Building an indigenous industrial and R&D capacity has its own set of problems, especially when the global ecosystem for 5G has matured, moved forward and simultaneously become highly competitive. Limited private sector capacity and academic interface leaves industrial and R&D capacity in the lurch. That partially explains India’s meagre participation at global standards bodies, where South Korea, United States, Japan and China are much more influential because of their contributions to inventions and patents underpinning 5G technologies. Without human and capital investments in this segment, it is just not possible to gain a foothold in product design, Intellectual Property, and standards development aspects of 5G technology. Currently, it seems that Indian telecom providers have no option other than to procure and deploy 5G technologies from foreign suppliers; this would translate into higher procurement costs and a rerun of the 3G and 4G experience, turn the country into a mere market for 5G technology suppliers, and exclude India from the global standards development ecosystem. There is also the uphill task of harmonizing radio-frequency spectrum for 5G rollout especially in the 24.5-29.5 GHz band, L band (1427-1518 MHz) and C band (3300-3700 MHz). The 5G High Level forum has recommended 698-803 MHz, 3300-3600 MHz, 24.25-27.5 GHz, and 27.5-29.5 GHz bands being made available for 5G rollout. Expensive spectrum is another barrier on the road to 5G. TRAI’s recommended price of INR 492 crore per MHz is 375 per cent higher than what operators in South Korea paid. Outrightly joining the 5G bandwagon may not be the best option for India, as some of the lucrative use cases like autonomous cars and connectivity in high-speed trains do not at present fit the Indian requirement. 5G, beyond the consumer segment, should also appeal to the industry for specialised applications. Declining ARPU and fierce price wars and battles for market share are already hurting the bottom line of Indian telecom service providers. Keeping in mind that India is a price sensitive market, 5G affordability will depend upon lower spectrum and equipment costs, efficient usage of the spectrum and network and infrastructure sharing across operators. In order to move up the value chain, Indian manufacturers need to think beyond assembly and manufacture, and build competency in areas such as R&D, design, testing and operational and support services built around telecom networks. As for the Government, a slight push in the right direction would be much more productive and efficient, such as treating telecommunications as a utility rather than a market, and building innovation and IPR ecosystems rather than incentivizing licensed production. The idea, at the end of the day, should be “Designed and Made in India”, and not just “Made in India”. 3. Mobile backhaul is a term commonly used to describe connectivity between base stations (BT) and base station controllers (BSC)/radio network controllers (RNC) in cellular systems. See, “Technology Digest”, Telecom Regulatory Authority of India, Issue 1, July 2011, at https://main.trai.gov.in/sites/default/files/201112190518470327500Tech_times_18_July.pdf, p. 1. 6. "Telecom networking equipment includes switches, routers, Base Trans-Receiver Stations, Multiplexers, and Antennae etc. 7. ARPU Revenue Report Q1 FY 2018-19 – June Qtr, Cellular Operators Association of India. 8. Cellular Operators Association of India, Annual Report 2017-18, at https://www.coai.com/sites/default/files/Annual%20Report%20COAI%202017-18.pdf, p. 11. 11. Department of Telecommunications, Government of India, National Digital Communications Policy 2018, at http://dot.gov.in/sites/default/files/EnglishPolicy-NDCP.pdf, p. 1. 14. See Note 11, p. 5.